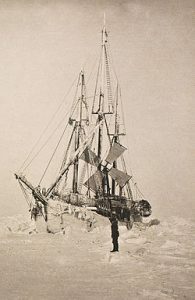 At the end of the 19th century, many observations indicated that the sea ice covering the Arctic Sea movesfrom east to west – tree trunks found on the shores of Spitsbergen and eastern Grenada were identified as originating from Siberia, fragments of equipment used by whalers from the Bering Strait. The decisive evidence was the remains of an American ship JEANNETTE, crushed by ice in the vicinity of the New Siberian Islands, which were found on the south-west coast of Greenland. A Norwegian polar explorer Fridtjof Nansen decided to check this hypothesis and use the ice movement to reach the North Pole. A specially constructed FRAM ship, which was supposed to resist crushing by ice, set off in June 1893 from Norway along the northern coast of Siberia – the so-called. North-East Passage, conquered a few years earlier by Nordenskjold on VEGA. The ship was stocked with food supplies for 5 years for a 12-man crew and a pack of dogs. Nansen intended to use sled dogs for a trip to the pole on the ice, if the ship’s drift route had to avoid the pole. The ship, frozen in the ice, was a safe and comfortable base for the trip. The crew conducted meteorological and astronomical observations, performed depth measurements of the sea and took samples of water and organisms living on ice and in melting pools. After almost two years, however, the ship was far from the pole and the current drift route indicated that it would not approach the pole more closely. Nansen decided to go to the pole on foot – with one companion, taking three dog sleds. He planned that the road to the pole would take about 50 days, and the return route would lead to the land of Franciszek Józef or Spitsbergen. Lack of communication with the ship made attempts to look for it more risky on the way back than a long way to the archipelagos in the south. They set off on March 14, 1895, but after a month of wandering in very difficult conditions they reached only 86o 13.6 ‘. Nansen decided to return. Stopping the chronometers caused that they lost the ability to determine their position. Wandering in increasingly difficult conditions lasted on August 6, when, after launching kayaks pulled so far on sleighs, they managed to reach the Island, they supposed to be located in north-western part of the Franz Josef Land Archipelago. The next island was located on an unseen map of the discoverer of the Payer archipelago. On August 28, Nansen decided on another wintering. They lived in a dugout covered with walrus skins for the next 8 months. On May 19, 1896, after a week of preparations, they used a catamaran built from two kayaks to travel southwest to the archipelago, intending to sail from there to Spitsbergen. However, on June 17, an unexpected change of their fortune happened – they met Frederick Jackson, a British polar explorer who prepared his trip to the North Pole on Franz Josef Land. Mr Winward’s expedition vessel took Nansen and Johansson to Norway. On August 18, they reached Hammerfest, and two days later Nansen received news that FRAM had freed himself from the ice in the north-west from Spitsbergen and flows to Norway. The meeting took place on August 26 in Tromso. FRAM’s journey along the coast of Norway to Christiania (Oslo) was full of enthousiastic greetind. In the capital, Nansen and his crew were received by King Oscar II. FRAM’s trip was the last Arsenal expedition of Nansen. He became a professor of oceanography at the University of Christiani, then, taking advantage of the huge popularity, took up political activity, became Norway’s ambassador to Great Britain, commissioner of the League of Nations for Refugees, and received the Nobel Peace Prize in 1922.